At the Smithsonian's natural history museum, 6 million years of human history comes into focus with the help of GW professors and students. An imagining of "Lucy" looks out from a habitat that demonstrates the significance of her species to our understanding evolution: muscular, ape-like torso and arms combine with more human-like hips and knees to form a species that was probably just as at-home in the trees as walking upright on the ground. The famous fossil was discovered in Ethiopia in 1974 and scientists have been enamored ever since: in English her name is borrowed from the Beatles' "Lucy in the Sky with Diamonds," and her native name is "Dinenesh," meaning "You are beautiful." Never mind the universe. Consider this: We weren't alone on this planet all that long ago. Just a hop or two back in time—as recently as 70,000 years ago—there were at least four species of humans roaming the Earth, including our own. They probably crossed paths from time to time, perhaps even mingled; or maybe they hated each other's guts. They were, after all, human. It's an eerie realization that haunts visitors to the new David H. Koch Hall of Human Origins at the Smithsonian's National Museum of Natural History in Washington, D.C.. The exhibition, which brings life to the 6 million-year path of human evolution and the quest to define what it means to be human, was a colossal undertaking that was created in part by GW faculty members, students, and alumni. "Who are we as human beings? How did we come to be here, and where are we going?" asked Rick Potts, director of the Smithsonian's Human Origins Program, speaking at the March opening of the nearly $21 million exhibition hall. The questions "get to the center of human curiosity." Dr. Potts, who is a professorial lecturer in anthropology at GW, says the exhibition is the first to examine human evolution within the context of climate change—how swings in climate and the environment fueled adaptations and the march of species. Modern humans (Homo sapiens) are thought to have entered the picture around 200,000 years ago, though at one point our numbers dipped so low we nearly died off. Still, our 200,000-year run so far may seem impressive until you consider that some earlier humans flourished for hundreds of thousands of years more before fading out. Fossils from more than 6,000 individuals have been found to date, belonging to more than a dozen species of early humans, from the altogether recognizable Homo neanderthalensis to Paranthropus boisei, who is a bit more … shall we say, Planet of the Apes. But, said Dr. Potts, they were more than names and dates (and hair). They "were once living and breathing. And these relatives are worth getting to know." Fortunately that family reunion is made pretty easy by the new exhibition. Nearly 300 objects are on display, including a rare Neanderthal skeleton and a cast made from preserved 3.6 million-year-old footsteps, as well as fashioned tools and early art. For GW anthropology professor Alison Brooks, the endeavor offered an opportunity to improve upon previous work, since she helped the Smithsonian build its former exhibition on human evolution in the early 1970s. Museum-goers pass through a "time tunnel" at the exhibition's entrance, which drops them off 6 million years into the past. In the meantime, Dr. Brooks, a research associate at the Smithsonian and an expert on the behavior and culture of earlier humans, helped keep the former exhibition up-to-date while her own research challenged the existing conventions of behavioral evolution. A decade ago, research by Dr. Brooks and a colleague suggested that, contrary to prevailing thought, the emergence of modern human behaviors—including the use of bone tools, long-distance trade, and art—came about gradually, instead of suddenly; that it originated in Africa rather than Europe; and that it began tens of thousands of years earlier than previously thought. She began pitching in on the new Hall of Human Origins several years ago, aiding development of the overarching plan for the exhibition and weighing-in on specifics, like the selection of objects to be shown—some of which are casts made from artifacts in her own collection, like a bone with a series of notches in it that she dated to 20,000 to 25,000 years ago. The fossil, she says, suggests that its users "understood the concept of multiplication by two." Much effort was made this time to create an exhibition with room built in for, well, evolution. The old exhibition had grown out-of-date within a decade, Dr. Brooks says, and since then there's been "an explosion of data." Even in the few months after the new hall's opening, another species of early human was identified, and researchers had sequenced the Neanderthal genome. To account for the current speed of science, some of the exhibition's objects are kept in cases rather than stuck to the wall, and there's space to detail the latest findings. "We think we have a lot of the general [evolution] outline," Dr. Brooks says, "but they've tried to leave a lot of leeway for understanding new parts and swapping specimens." It was the evolution of the exhibit that was as much on-display as the fossils for professor Alison Brooks, who helped create the Smithsonian's previous exhibit in the 1970s and worked over the past several years to help shape the new one. Passersby reading the exhibition's wall panels might also glimpse a photo of GW professor Bernard Wood, director of the university's Center for the Advanced Study of Hominid Paleobiology, alongside his explanation of how scientists determined the amount of time it took our ancestors to mature; or a photo of anthropology professor Brian G. Richmond, amid a display of skulls, with an explanation of how scientists identified them as belonging to humans. Both professors also are affiliated with the museum (Dr. Wood as an adjunct senior scientist; Dr. Richmond as a research associate) and were consulted on the fundamentals of what to include in the exhibition, as well as on facts and some displays. Dr. Richmond, for example, an expert on the evolution of the human skeleton, advised on how long the toes should be on a reconstruction of the famous 3.2 million-year-old "Lucy" fossil. Not far from "Lucy" in the exhibition is a replica of a thigh bone, which, due to Dr. Richmond's analysis, is recognized as among the oldest evidence of upright walking, dating back 6 million years—around 1.5 million years earlier than previously thought. Most jarring of the exhibition's treasures, perhaps, is a series of phenomenally lifelike facial reconstructions that do much to breathe life into the surrounding artifacts; they're so nearly alive the faces seem to give off a whiff of personality. As part of her Ph.D. track at GW's Center for the Advanced Study of Hominid Paleobiology, doctoral student Kes Schroer completed an internship with the museum's Human Origins Program. For nine months last year, she worked on the exhibition's companion website, helping to expand on concepts and artifacts from the exhibition. "This was a dream come true," Ms. Schroer says. "My parents will tell you I've been wanting to work at the Smithsonian since I was old enough to say 'Smithsonian.'" Anthropology professor Brian G. Richmond talks with a reporter about the reconstruction of the famous "Lucy" fossil at the Smithsonian's Hall of Human Origins. Research on the same fossil by Amanda Henry, PhD '10, made it into the exhibition. While working for the museum and finishing her anthropology degree, Dr. Henry scraped plaque off of the teeth of that Neanderthal fossil and a dozen others. In some cases she was able to identify plants they had eaten, contradicting claims that Neanderthals were strict carnivores. Dr. Wood, who studies the family ties among ancient species, says the new exhibition goes beyond its predecessor, in part, by showcasing the science behind the results. "It's not so much just what we know, but how we came to know it," he says. And it aims "to help people understand the implications of this evidence." Dr. Richmond says the effort will hopefully help bridge the gulf, for some, between science and theology. "Science can't answer questions about religion; those are separate things," he says. But the trove of existing artifacts offers "a very rich record of our heritage. And I don't think that should challenge people's faith, just as discovering that the Earth was not the center of the universe shouldn't have challenged people's faith 400 years ago." 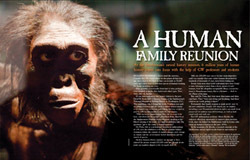 In standing face-to-face with the past, Ms. Schroer, the doctoral student, says she hopes visitors "find a connection with these other humans that have existed over time. "I think it's pretty special that we're the only humans left, but there were other species that came before and lived during our time period," she says. "I hope people find a human connection with this history."